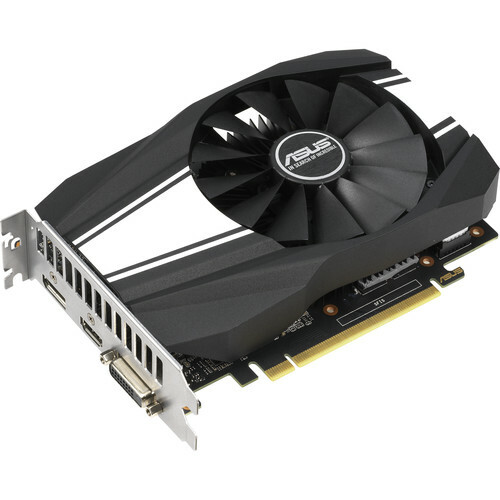 Based on the Turing architecture, the ASUS GeForce GTX 1660 Phoenix OC Graphics Card provides improvements in performance, memory bandwidth, and power efficiency over its predecessor, the high-performance Pascal architecture. The front panel of the card features a variety of outputs, such as DisplayPort 1.4, HDMI 2.0b, and DVI-D. The GTX 1660 is not just about high-resolution gaming. Computationally intensive programs can utilize the GPU's 1408 cores to accelerate tasks using CUDA and other APIs. For cooling, ASUS implemented a single-fan cooler. It features a single dual ball-bearing fan. With reduced friction, it also runs smoother, further improving card lifespan and cooling efficiency.